This finals week has been hell but, things have to get done. So here is something that after spending countless nights staying up , I have finally finished! This is a new Nightmare horror comic called” Falling Awake” and involves consumption, devolution, and surreal landscapes! Of course also it has a lot of my creepy creatures and stuff so don’t worry for those who enjoy that stuff. Also this is one of the first comics and or works of art that uses color thank to my wonderful partner Grace Chadwick! No one understands colors as well as she does! So here are few of my favorite panels from my 20 page comic to enjoy. If you’re interested in seeing the rest stay tuned for future updates. 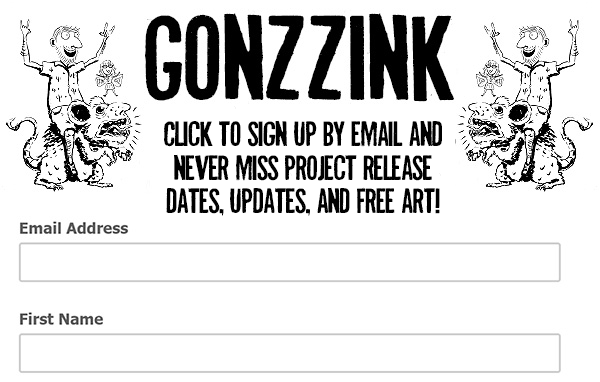 Previous Post Gonzzink in Italy!? Baby head Iron Cast!!! Next Post Cement Sculpture “Solitary Confinement” Finished!